This supplemental pack is aligned to the Journeys 2011/2012, 2014, and 2017 curriculum for 4th grade. 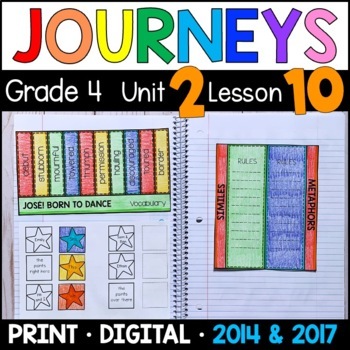 This Journeys Grade 4 supplemental pack is created to supplement Unit 2, Lesson 10 (Jose! Born to Dance). The reading responses, activities, and interactive notebook pages focus on the Reading Literature and Language sections of the curriculum. CLICK HERE for ALL Journeys Lessons and Bundles available in my store! These pages were designed to be engaging to students, yet rigorous. The fonts are interesting but easy to read, interactive notebook pages are included, and students are given opportunities to color and cut & paste. Students must have access to the text as they work, as many pages require text evidence. Click PREVIEW for many full-page previews! Students love these interactive pages! 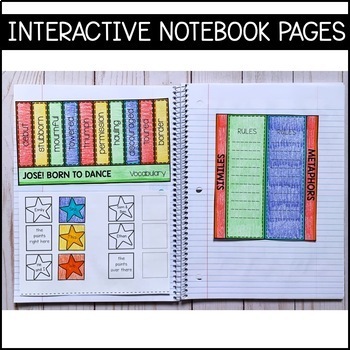 Don't worry if you do not use Interactive Notebooks in your classroom. The interactive pages in this lesson can be glued onto notebook paper or construction paper. You can even staple a "notebook" of lined paper for them to use with their Journeys lessons! They'll love this new way of demonstrating their learning. 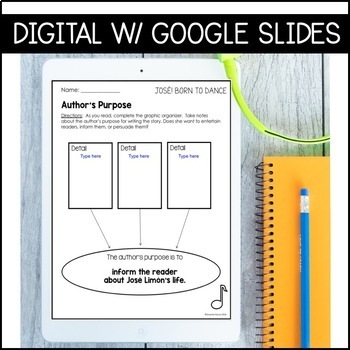 •	Author’s Purpose – Students take notes on the author’s purpose for writing the story. 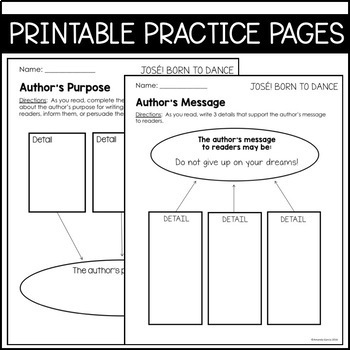 •	Author’s Purpose 2- Just like the previous page, but the author’s purpose is provided. Students must support the purpose with 3 details from the text. •	Author’s Purpose and Author’s Message – Students color details according to whether the details support the author’s purpose to inform, or the author’s message to not give up on your dreams. •	Author’s Message - The author’s message is provided. Students support the message with 3 details from the text. •	Analyze and Evaluate - Students analyze their own understanding of the story. They note any tricky words they read, the possible meaning, and then define the words using the dictionary. •	Analyzing the Text - Students reread the last paragraphs (provided) of the story. They analyze the importance of 6 key lines. •	Analyze and Evaluate: Book Recommendation - Students complete the book recommendation. They explain the author’s purpose, the author’s message, who would enjoy the book, and rate the book on a scale of 1-5. •	Biography - Students complete the biography of Jose Limon, using the signal words to guide them. •	Similes and Metaphors - Students color the stars according to whether they are examples of similes or metaphors. •	Essential Question – Students journal write about the story’s essential question. •	Vocabulary Word Wall Words – The 10 vocabulary words are printed in large, in black & white, to be printed and hung in the classroom. •	Shades of Meaning - Students study the lists of words. They write the words according to the level of intensity. This is a bonus skill not included in the 2011/2012 publication year. •	Pronouns - Students complete the sentence by cutting and pasting the correct pronoun into the statement. Students also combine simple sentences using pronouns. •	Pronouns 2: Students cut and paste to match each proper noun to its pronoun. An entire year of Journeys supplements for your 4th Grade classroom! More materials available for Unit 2! Please Note: These materials have been created by Amanda Garcia. The materials are not developed or endorsed by the Houghton Mifflin Publishing Company.